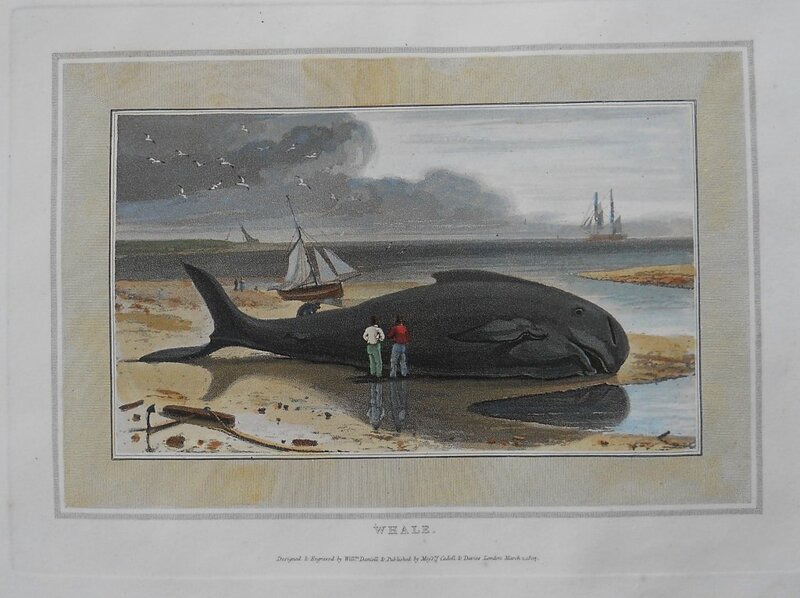 Wonderful landscape/seascape engraving with beached whale in foreground. This unusual hand colored aquatint was the work of William Daniel (1769-1837) a highly regarded English landscape painter of the early 19th century. Daniel along with his Uncle Thomas Daniel are best known for their sumptuous and accurate paintings and aquatint engravings of India, as well as wonderfully descriptive and accurate renderings of the British Isles. Daniel also contributed some beautiful natural history images in a volume titled, Interesting Selections from Animated Nature with Illustrative Scenery, this text was often inserted in the large paper copy of William Wood’s Zoography of 1809.Terrific engraving with original accompanying text. Measuring 10 ¼ x 12 ¼ inches sheet size. Clean impression, some slight foxing stains well outside plate mark on outer edges of margins.